NOTE: Sometimes, these automatically generated citations accidentally leave out information. Review the citations and make the necessary corrections. Some of our databases -- such as EBSCOhost, ProQuest, JSTOR, and Opposing Viewpoints in Context -- provide pre-formatted citations! 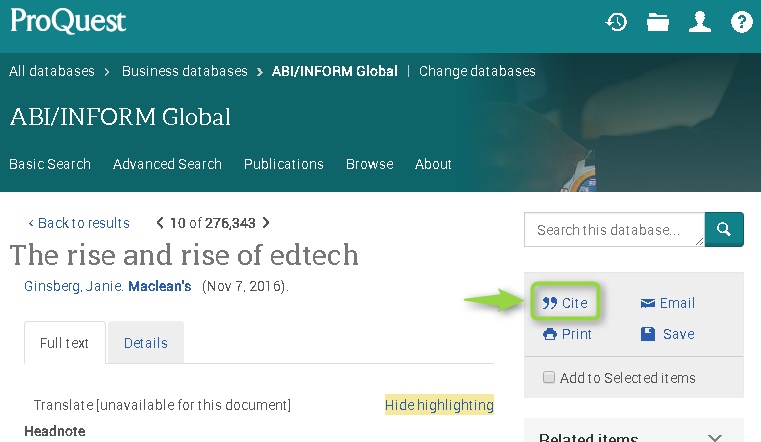 Look for a link or button called "Cite" or "Citation." Many of these services also offer browser extensions for Chrome and Firefox. Note: Office 2016 currently doesn't support MLA 8th ed. Here are a selection of popular free and paid citation management software products. Purdue's Online Writing Lab has thorough instructions and examples of MLA formatting. Do You Need Citation Help? The Library offers a variety of information literacy instruction. Instructors may request an in-class workshop for Annotations and/or Citations by filling out this form. The Student Learning Center (SLC) also provides drop-in tutoring. Be sure sure to check their current hours here. You may also visit the Library for citation help, or use the "Ask a Librarian" form on the Library website. A goldmine of citation guidance and examples, produced by the Library @ Los Angeles Valley College.